The first concrete application of Grant’s theoretical interests [in preserving species in “pure”, untouched state] to actual human beings came in 1906, with the arrival of an African pygmy named Ota Benga at the Bronx Zoo. Brought to the United States by the American explorer and collector Samuel Verner, who obtained him from local captors in the Congo in exchange for a pound of salt and a bolt of cloth, Ota Benga was “employed” at the zoo in a capacity that involved his being dressed in white trousers and a khaki coat, and presented to the public for viewing. On Sunday, September 16, 40,000 people went to the zoo, and everywhere Ota Benga went that day, the New York Times reported, crowds pursued him, “howling, jeering, and yelling.” The newspaper reported that “some of them poked him in the ribs, others tripped him up, all laughed at him.” When a group of colored ministers protested against what they viewed as Grant and Hornaday’s degrading treatment of the pygmy [William Temple Hornaday was director of the zoo at the time], the Times haughtily protested, “It is absurd to make moan over the imagined humiliation and degradation Benga is suffering. The pygmies … are very low on the human scale.” In March 1916, Grant’s pygmy, who had since moved to Lynchburg, Virginia, where he was called Otto Bingo and sent to work in a tobacco factory, went behind a stable and then shot himself in the heart with a borrowed gun. Ota Benga and social Darwinism as a justification for imperialism. Benga's purchaser was Samuel Phillips Verner, an American anthropologist and missionaryfrom South Carolina, who had been commissioned by the St. Louis World Fair to collect Africans to put on display at the Fair with other non-European races of the world. When the Fair ended in early1905, Verner brought Benga back to the Congo; however, his own tribe had been wiped out andBenga was completely alone. Thus, in the summer of 1906 he returned to New York, and inSeptember, went on exhibit in the monkey house of the Bronx Zoo. Benga's physical features, suchas his below average height and sharpened teeth, along with his interactions with the zoo'sorangutans were the focal points of the show, attracting up to 40,000 visitors in one day. There has been and still an undercurrent of racism throughout many empires. Sadly it is still carried on by some even today. Today we don't call them "Pygmies" but Bushmen. Benga's treatment was appalling but we have moved on from that now. The military uses it in training. The trainees must be able to de-value the enemy that way so they can go and kill them. So Iraqis become "Towelheads, Sandhoppers, Godless" etc. The Vietnamese became "Gooks and Mudsuckers" not fellow human beings like us. It was glorified in the flick 'The American Sniper', Kyle wasn't killing humans but animals and it has been the norm throughout history by many Empire Builders. Benga was regarded as being monkey-like, Humans are not monkeys we are apes, as Darwin actually said in his writings but was co-opted by the Bible-bashers of the time and even now. Very sad... racism has a strong religious root. "Slavery was established by decree of Almighty God...it is sanctioned in the Bible, in both Testaments, from Genesis to Revelation...it has existed in all ages, has been found among the people of the highest civilization, and in nations of the highest proficiency in the arts." Solomon 1:5 - 6. "Nigra Sum nformosa" = I am black but/yet beautiful. Notice the 'but' or 'yet'? Luckily science is not blinded by religion like it used to be. Sad but true Ags. The Benga case was 100 years ago and in the most part science and society have moved on. One of the most dismaying stunts ever pulled in the name of anthropology -- the queen of the social sciences -- receives its first full airing in this poignant and wild recital of greed, exploitation and social Darwinism in turn- of-the-century America. 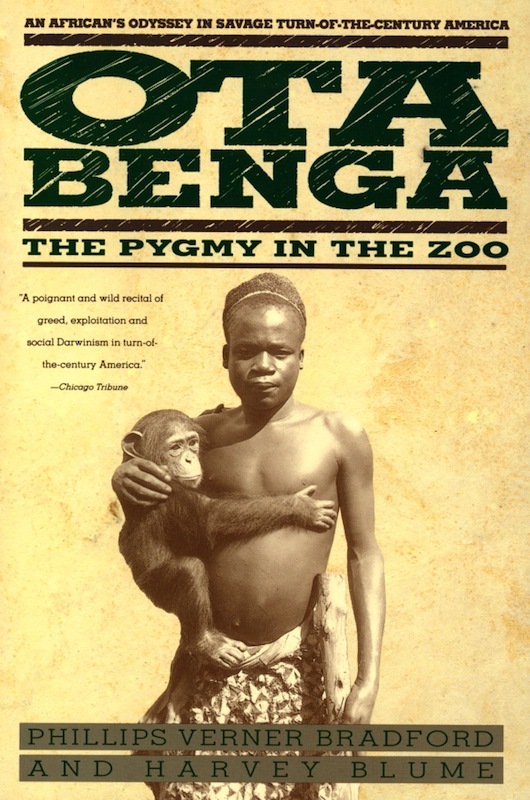 On Sept. 8, 1906, to the horror of a few and the delight of many, Ota Benga, an African pygmy, was placed on display with the apes in the Bronx Zoo as a missing link in human evolution -- a small black African man who was supposedly closer to the apes than his white counterparts. Darwinism had nothing to do with the fact that Verner was a racist. In fact, the evolutionary theory debunks racism by showing we are all the same and that we all come from the same ancestors, whatever colour your skin may be.... you have got to be blind not to see it! “With savages, the weak in body or mind are soon eliminated; and those that survive commonly exhibit a vigorous state of health. We civilised men, on the other hand, do our utmost to check the process of elimination; we build asylums for the imbecile, the maimed, and the sick; we institute poor-laws; and our medical men exert their utmost skill to save the life of every one to the last moment. There is reason to believe that vaccination has preserved thousands, who from a weak constitution would formerly have succumbed to small-pox. Thus the weak members of civilised societies propagate their kind. No one who has attended to the breeding of domestic animals will doubt that this must be highly injurious to the race of man. It is surprising how soon a want of care, or care wrongly directed, leads to the degeneration of a domestic race; but excepting in the case of man himself, hardly any one is so ignorant as to allow his worst animals to breed. So what is your thoughts on the subject RC? Yours, not copy and pastes. The great break in the organic chain between man and his nearest allies, which cannot be bridged over by any extinct or living species, has often been advanced as a grave objection to the belief that man is descended from some lower form; but this objection will not appear of much weight to those who, from general reasons, believe in the general principle of evolution. Breaks often occur in all parts of the series, some being wide, sharp and defined, others less so in various degrees; as between the orang and its nearest allies—between the Tarsius and the other Lemuridae between the elephant, and in a more striking manner between the Ornithorhynchus or Echidna, and all other mammals. But these breaks depend merely on the number of related forms which have become extinct. At some future period, not very distant as measured by centuries, the civilised races of man will almost certainly exterminate, and replace, the savage races throughout the world. At the same time the anthropomorphous apes, as Hermann Schaaffhausen|Professor Schaaffhausen has remarked, will no doubt be exterminated. If you had read his books you would understand that when he speak of races he doesn't mean black, white, oriental, etc, as he only believed in ONE race, the human race. By races he meant 'varieties'. He does refer to some as savages, but you have to remember that it was the way people spoke then. If Darwin was a racist he would have never, I repeat NEVER, fought to convince the world that we are ALL one and the same, all descendant of ONE ancestor. I have copies of Darwin's original books here but I haven't read them for awhile. Must do so again! Verner was a Baptist Missionary/Explorer and I suspect that clouded his looks on life. He was passionately against Darwin and a firm believer in the biblical stories of the origin of man. His exploring was more to prove the bible rather than further knowledge. That the Sun-Sentinel published this shows a lack of editorial integrity. The editors should have checked on the subject thoroughly before publishing it. Bearing in mind that the Sun-Sentinel is a Miami/Palm Beach publication in a state that has a tendency to have racial undertones. Like Ags suggests, always check your sources RC. Very often words and phrases are changed to suit the message the writer wants to portray.